Tomorrow is the first Standards-Based assessment that many of my students will take. The job of class today was to remind them how the process goes, what the assessment will look like, how they will be scored and then give them the remainder of the time to practice and ask questions. They utilized the time incredibly well and several stayed after school to work together. I, on the other hand, had a wildly unproductive day as I spent most of it trying to get the formatting of my assessments the way that I want them. Yikes! Can we answer any questions for you? Turns out, the answer was "Yes! They COULD answer some questions for me." But, in true Microsoft style, they answered questions I didn't ask, such as how to place a picture in Word when using a MAC. They linked me to a generic FAQ site that was 90% unrelated to my query. 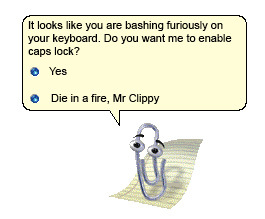 So it turns out that Clippy is alive and well! He is now running the Microsoft social media account. I promise that I didn't scream profanity in a room full of students.